What happens when an industry responds to what it sees as a change in consumer desires and bases its change on an incomplete and unsatisfactory solution? A prime example of this was described in the subject of your article, “Clearing the Cages, but Maybe Not the Conscience.” What I concluded from the reporting was that the chicken/egg laying industry responded to the pressure from animal rights activists because they perceived it as a threat to their profits–not as a choice to provide a truly healthier environment for the chickens. This was expressed in their ill-considered solution to the previous method of isolating each bird in a cage for its lifetime. So, it is not a matter of “conscience” that is the issue, but rather a choice to be made for a viable transition from a destructive method to a creative and positive approach based on a broad input of practically applied knowledge. In order to claim that their chickens can be deemed raised in a “cage-free” condition, the egg producers built giant cages and soothingly called them ”aviaries”, which sounds open and free. However, one look at the photographs that accompanied the article illustrated the reality. Hundreds and hundreds of chickens are packed together in large indoor spaces and wallow in rapidly accumulating piles of feces and concentrates of ammonia from the collective amount of urine. The overcrowded conditions with restricted ability to have healthy exercise leads to aggressive pecking behavior resulting in bloody wounds. And what happens to this blood and to the dead chickens that lie in this smothered environment? This is not a healthier environment for either the workers who are exposed to the “particulate matter emissions” from the decaying mess or for the chickens who constantly live in it. Can you imagine having to wade through the hundreds and hundreds of chickens and their waste in order to collect the eggs? Darrin Karcher, a poultry extension specialist at Michigan State University was quoted in the article as saying, “It’s the nature of the system itself that is problematic.” I am not sure what he meant in that statement but my view of it is –yes, we have to look at farming, whether it is for protein, as in meats and eggs, or for produce, from a longer and larger view based on the methods practiced that are an investment in the future of being able to produce a quality and quantity of nutritionally rich food to feed the growing world population. It is the complete system or journey that needs to be considered. Not just from “farm to table” but from “soil to table”. What do I mean by that? That every input determines the aggregate of the whole–that is, the health of the nutritional value, taste, and texture of the product–the FOOD. 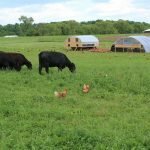 The non-industrial sized farmers who are pasture raising their animals are doing it based on an approach of multi-spectrum farming. That is, they create a foundation of diversity. 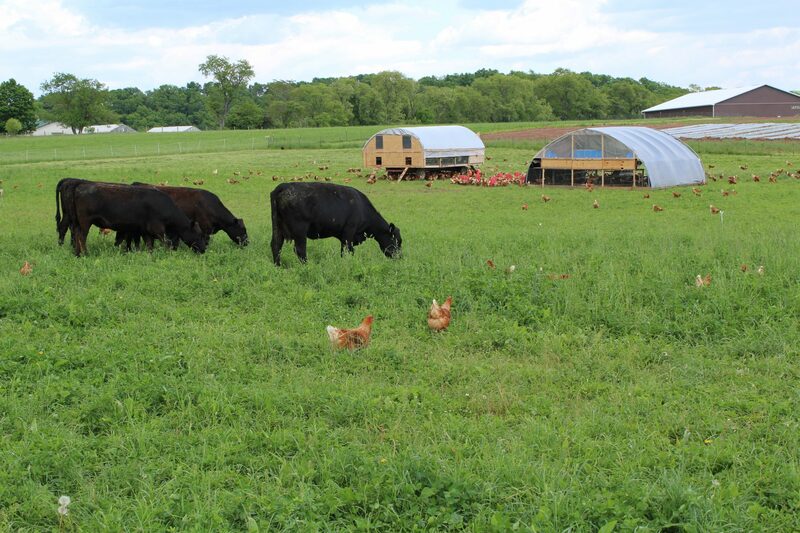 In their pastures, they plant a diversity of grasses for grazing with very little dietary supplement of grains (which when used a solo choice of diet does damage to the farm animals’ digestive system). They have a diversity of animals which follow a rotational journey through the pastures that both suppresses the insect population and mutually and naturally fertilizes the rich source of nutrition for the farm population. Incorporating the raising of produce into this farming framework broadens even further the capacity for not being dependent on a single product for a livelihood. Monocultures are a risky business and not environmentally sound. This example of combining the best from past farming methods with the advantages of innovative uses of technology can facilitate a reconfiguring of our present dominant farming systems into a cleaner production and an ability to pass on to the next generation –a soil that is rich in biological diversity and that is held in place for future use rather than being eroded and lost due to inadequate organic matter to hold it in place. It is a challenge that can be accomplished with the willingness to orchestrate different attainable methods, support from business and government and the public, and education about the advantages of healthy simple eating.